India remains the undefeated outsourcing capital of the world with its low labor cost, large availability of skilled resources and high–end infrastructure. Another factor that has made India popular in the outsourcing market is its flexibility in meeting customer requirements. Unlike other outsourcing locations, that have fixed pricing structures, India offers companies with the flexibility of choosing a pricing model that best suits their business requirements. Indian vendors offer a wide range of pricing models, such as pay per unit, fixed rate, variable rate, cost plus profit, profit and risk, performance based and bundling. While some pricing models are best suited for maintenance work or product support, there are other payment structures that are beneficial for long term projects or changing business objectives. The following information will help you to choose a pricing model based on your business objectives, type of work outsourced, the duration of the project and the amount of work to be outsourced. When you outsource to India, you can opt for a variable rate pricing structure, where you pay a fixed basic rate, but also have the flexibility to pay more for additional/ higher services or pay less when the market price goes down. You can opt for this payment structure if you want to try out a new Indian vendor for the first time. If you are satisfied with the quality of work, you will only have to pay a little more for additional services. In the fixed rate pricing model, you will have to pay a fixed charge to the Indian vendor throughout the course of the outsourcing contract. Many companies prefer this pricing structure, over others, as they can predict the outsourcing cost in advance. However this may not be the best pricing model for a long term outsourcing contract, as you may not be able to reduce the cost, even if the market price goes down. This would be the ideal pricing model for one–time or short–term outsourcing projects. In this pricing model, the Indian vendor will offer you a unit–based set rate and you will have to pay for the service, depending on the amount of your usage. For example, when you outsource maintenance services to India, you will only have to pay for the number of units that you have used to avail the maintenance service. In this pricing structure, you will pay your Indian service provider based on their performance. When you are happy with service provided, you will have to reward your vendor with incentives. If you find the services unsatisfactory, the vendor will pay a penalty. By opting for this pricing model, you can be sure of the quality of work, as your vendor knows that they will be given incentives based on the level of their performance. If you have clearly defined business objectives along with unchanging outsourcing requirements, you can opt for this payment structure. In the cost plus profit pricing model, you will have to pay the Indian vendor the actual cost along with a fixed percentage. The only drawback with this pricing model is that it does not offer the flexibility to include changing business objectives or technologies. This type of payment structure is usually opted for in the outsourcing of IT services. As an outsourcing customer, you will pay a fixed price for two or more IT services/products which are bundled together. By opting for this pricing model, you will be paying less for two or more outsourcing services. However, you must ensure that you do not bundle IT product support with short–term services, as you will have to pay for the services, even if you not require them later on. In this pricing model, you and your Indian vendor will be equal partners in the outsourcing project. When the business objectives in the project are met, both you and your vendor will be able to enjoy the profits. Likewise, loss also will be equally shared. You can opt for this model if you are sure about the capabilities of the vendor. India is the ideal offshore destination for any service, be it mobile application development, customer support, transcription or healthcare support. As an outsourcer to India, you can experience manifold benefits in terms of cost, time, human resources and profit. Make a business decision to outsource to India and leverage the cost advantages that only India offers. Get in touch with us to start outsourcing to India. Why cheaper is not always better. 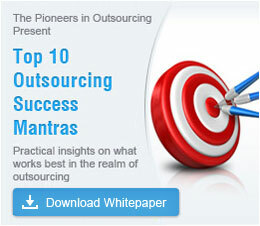 Does your organization have an outsourcing plan?